On our guided walk through Granada and the Albayzín, one of the most interest provoking places for visitors is La Madraza de Granada. Also known as Yusufiyya or house of science, this building, located on Calle Oficios was the first Andalusian university, founded in 1349 by King Yusuf I. It was the headquarters for the Muslim School of Koranic Law, and was found in one of the great areas of the city, making up the heart of medieval Granada, between the Great Mosque and the commercial area, represented by Lonja de Mercaderes, and the old silk market, the Alcaicería. Among the poems adorning it one can read “If your spirit finds the desire to study and flee from the shadows of ignorance within, you will find the beautiful tree of honour in doing so. Make great individuals illuminate through study, and raise those who are not great up to the same light”. After the Catholic Monarchs took Granada, the building was converted into City Hall, a gathering point for the gentlemen who governed the city. The elegant and spectacular mihrab is the only area of the Islamic building that has been conserved. The inside is richly decorated in the Nasrid style, with stucco reminding you of the palaces of the Alhambra. Currently, the building has gone back to its roots as an educational institution and belongs to the University of Granada, being one of the most important and beautiful cultural centres in the city. It is also the headquarters of the Real Academia de Bellas Artes de Nuestra Señora de las Angustias. Its architecture, as with all construction work by Yusuf I, was splendid, with the white marble doorway that has its remains conserved in the Museo Arqueológico de Granada. The building was organised around a central pool (recent archaeological excavations undertaken in the building have incorporated the palace remains). Within the same building the Muslim Sala del Oratorio from the 14th century as well as the room of Caballeros XXIV on the upper floor, which conserves its impressive Mudejar framework from the 16th century in the hall which was used for meetings by the city councillors after the reconquest. 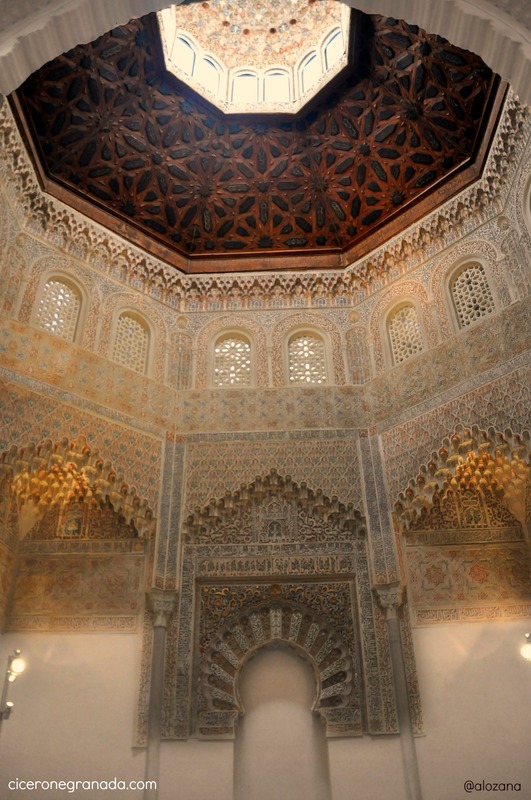 La Madraza provided, among other instruction, teaching on Law, Medicine and Mathematics, and continued operating as a university until the end of the 1499 or the start of 1500, since after the Castilian conquest, La Madraza was allowed to continue operating. Many criticise it as having been a Koranic school, which only taught Islam, and to Muslims. However, La Madraza was much more. Ibn Hazm (Fisal) decided on the study plan for the “Andalus philosophical school”, where the students “place their intellectual attention on mathematics and begin their scientific training by in-depth study of the properties of numbers. Later they progressively study the position of the stars, the visible shape of the heavenly bodies, the way of verifying the passing of the sun, moon and the five planets (…) and all the other physical and atmospheric phenomena and incidents. To this, they add reading some Greek books where the laws regulating discursive logic are established”. However, towards the end of 1499, with the arrival of Cardinal Gonzalo Jiménez de Cisneros, the policy of tolerance and compliance with the conditions of surrender that Archbishop Hernando de Talavera had maintained up till that time was no longer continued.